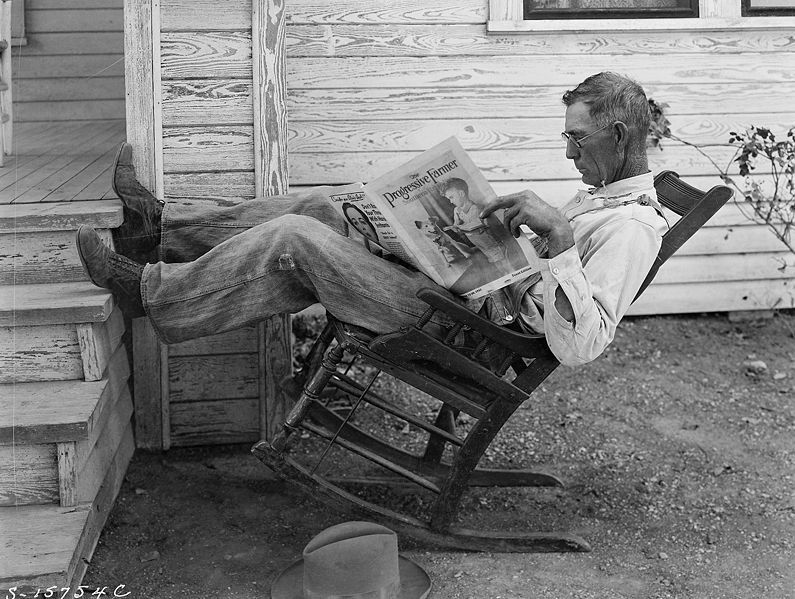 “Farmer reading his farm paper,” by George W. Ackerman, Coryell County, Texas, September 1931. Photo courtesy of the National Archives and Records Administration, Records of the Extension Service. BlogWest introduces the debut of our new feature, Weekend Reading, compiled by geographer Brent Olson. Brent completed his doctorate in geography at Syracuse University. He is currently an assistant professor of Environmental Studies at Westminster College in Salt Lake City, Utah. Brent’s work on the relationship between human knowledge of and interaction with the natural world, particularly in the American West, has led him to delve deeply into points of tension and convergence between groups engaged in all kinds of activities on public land. He is the only person we know who floated the entirety of the Snake River as part of his experiential research. Apparently we’ve timed the start of this poorly. Tina Brown, magazine mogul, has declared “the end of reading.” I don’t buy it. Weekends require reading. This week’s suggestions range from diatoms to drones and from aqueducts to a desert apocalypse. No theme, just the exploration of the written word, some fascinating ideas, a few beautiful images, and a world of sound. If reading is passé, we better be eclectic in our archaic pastime. I won’t complain if we prove Tina Brown wrong in the process. Sometimes retirement leads to the best work. Loren Bahls became a citizen scientist and helped discover 16 new diatom species. It is difficult to overstate the importance of the LA aquaduct to the city. As part of a city wide celebration of the 100th anniversary of the aquaduct’s opening, Kahrl explores the history and meaning of LA’s water. Sun, fatbikes, the desert, booze, and a bunch of friends. Our drones might fly over Middle East, but the pilots live and work in the West. Matthew Power’s profile of one such pilot puts an alarmingly human face on the drone war. Every few years or so an old scheme to water the West is dusted off and brought out for discussion. This time, the debate features the future of the Missouri River and the Ogallala Aquifer. The proposal for 11 Northern Colorado counties to form their own state flopped in the polls this week, but state secessionist movements continue to gain ground across the West. In light of this, it’s worth asking: What kind of place would this be? Cormac McCarthy’s first foray into screenwriting has received mixed reviews, but Bill Morris argues that the the “The Counselor,” directed by Ridley Scott and starring Michael Fassbender, Javier Bardem, Cameron Diaz, Penelope Cruz, and Brad Pitt, shatters our expectations for how a film is supposed to work. That’s a good thing. Western historians and others have long argued that nature isn’t just out there, in the big wild places, but also on our doorstep and in our backyards. Donoghue review of Haupt’s new book celebrates the lively prose and is left with larger questions about our relationship to the natural world. If you are near Washington DC you may want to swing by Timothy O’Sullivan’s show at the Smithsonian. If you (like me) are far away, you’ll have to settle for Alaxander Ewing’s survey of this early Western photographer’s work. The controversy over maintaining ever-larger herds of wild horses, adopting them out to appropriately skilled owners, and fostering them in private refuges is surfacing once again. Check out the trailer for a new movie that gets at these complicated issues in an innovative way. See “American Mustang” the movie – http://americanmustangthemovie.com/.